en.StemCellsandAtomBombs.org: Cure Captains - Now Recruiting! Cure Captains - Now Recruiting! Firstly, I want to say thank you for signing our petitions for a paralysis cure. Your voice has already had a great impact and now I want you to commit even further to a cure for paralysis in just thirty seconds. I'm not going to ask you for your money. I'm going to ask for a much simpler but more effective commitment. I want you to become a CURE CAPTAIN because cure's not going to happen on it's own. Today, I want you to become a leader in getting your own social network to support our campaigns for cure. We often hear the myths about how Facebook and Twitter caused the Arab Spring, but it's not true. Facebook didn't cause a revolution, it was dedicated people who yearned for freedom that used Facebook. Twitter didn't have people pouring into the streets, it was those who believed in the power of people who used Twitter. I know that there is a lot of hype about the impact of social media these days, but it's actually about how you use social media. We've had a lot of successes using the campaign function on this blog and I want us to keep winning. Every small victory empowers more people to demand cure NOW! 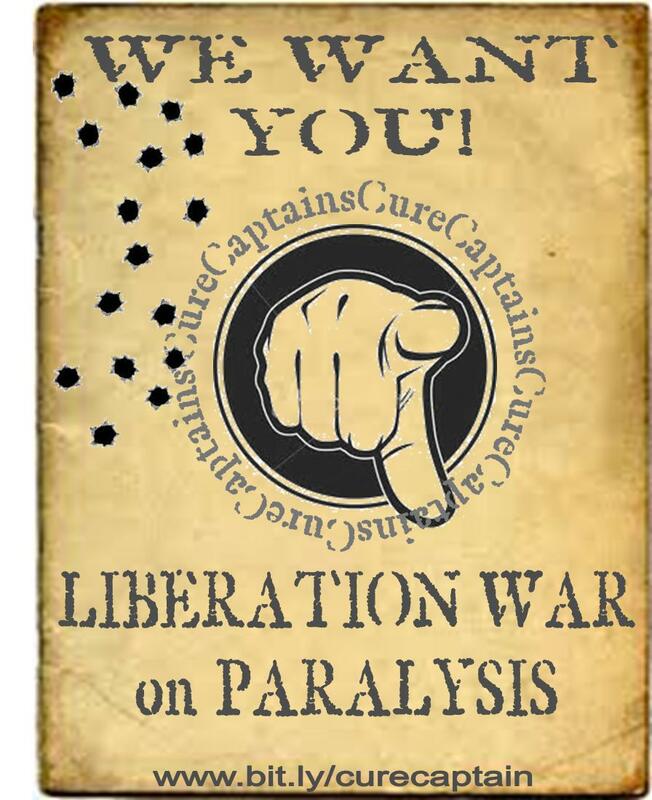 So today, I want you to to enlist in the Liberation War on Paralysis as a Cure Captain. What's a Cure Captain you ask? A Cure Captain of course participates individually in cure campaigns, but more importantly, organizes others to participate. It's like taking care of your own platoon or company and leading them to support a cure for paralysis. Building your own group of supporters for paralysis cure and making sure they're getting direct emails about our campaigns from YOU, a person they know and trust. Keeping your facebook, twitter, and other social networking pages up to date in our Cure Campaigns. Organizing materials in other languages. Generally organzing a mood amongst your 'supporters' that they CAN CURE paralysis. Whatever other way you know to get the word out. Want to enlist? Fill in the form below and I'll get back to you soon. Just want more information? Fill in the form and I'll get back to you soon to convince you to take up arms. Do you grant Dr Young immunity? You would be very surprised if you saw where the JustADollarPlease funds are going. Right off the top Rutgers takes a 10% fee which according to regulation donors were supposed to have been informed. To date they collected $389,000 and already $227,000 has been spent. With no FDA application, nor any clinical trial center chosen nor trial investigator, that $227,000 spent on salaries and fringes sounds unwarranted. BTW those funds are from desperate well meaning people with sci. Desperate people should educate themselves about carnival barkers. Many have been to China and India for injections of stem cell junk and reported that none of it works anyway. There's no animal experiments that show that it even should. I assume you are including the 4% fee the credit card companies charge. Also you assume that the people who administer the fund at Rutgers work for free. If there is a 10% fee and you object to it, mail your check in directly. Or does that remove your excuse for not giving? As for where the funds are going. These funds are for research, not only clinical trials. If you don't believe that Rutgers is an ethical institution, donate your hard earned money somewhere else. Or can't you find anyone doing research for free? BTW, I am an SCI, and I gladly donate. Furthermore, I try to donate enough to cover the cost of finding a cure for people who want a cure for free -- like you. The world is full of people who want a free ride. I hope you enjoy yours. Yes, there should be transparency, but like the guy who answered second already said, if you don't like what they do, send your money elsewhere OR try to change the way they spend money. But regardless of that, research costs money and there are no free rides. Well I would like an explanation of what the money was spent on. I could agree with that. We after all did question RHF. > Well I would like an explanation of what the money was spent on. Don't we feel entitled? You do realize that hiring a reputable oversight group would cost more than $200K? For example: $175.26 for 30 lab rats, $27.56 for rat food, $253.66 for new cages, etc. Would that be enough for you? Probably not. Just spend your money on something for you, the rest of us will play for you, if you will just stop making unfounded and false accusations. 1. There is accountability for every dollar spent. in the end they spend the rest of their lives working on the same types problems. I don't feel entitled. There's no reason to believe that any of these unfounded therapy ideas should be injected into humans without animal studies being done first. I wouldn't be silly enough to send him money in the first place! This is the portion of total expenses that is spent on charitable programs. In CharityWatch’s view, 60% or greater is reasonable for most charities. The remaining percentage is spent on fundraising and general administration. Note: A 60% program percentage typically indicates a “satisfactory” or “C range” rating. Most highly efficient charities are able to spend 75% or more on programs. So, it looks like JustADollarPlease is one of the most efficient charities, i.e. fund raising organizations. Well those that still believe he can fix you so no one will know the difference in just a few years are finally speaking up. Until you become cynical you will hold on for dear life and have blind faith. I just would like to know exactly how $227,000.00 was spent and look at the reaction; you guys are way to overprotective. And yes that 10% fee is too much, it's not for any fund raising work done by Rutgers, it's just a fee that automatically comes off the top, it's just like giving a gift to Rutgers. None of you knew about the fee before I mentioned it, although you were supposed to be told about it. I'm sure except for maybe the few who defended that fee here, most wouldn't want $100,000 of every million going to the Rutgers cash register when they donated. Another thing to consider, how will a trial take place with the 160,000 balance. Disclosure of the fee policy is made to donors on all gift receipts. To begin with, clinical trials are funded by biotech's since they're the ones hoping to make billions in profit off our injuries. No biotech funding, a foreign country where no regulations were in place...no animal data to support efficacy claims. Total silliness. "The travesty is that many therapies are regenerating spinal cords and restoring function in animals but so few have gone to clinical trials. With JustADollarPlease.org you can help make this happen." That's very misleading as the combo treatment of umbilical cord cells + lithium was never tried in an animal. 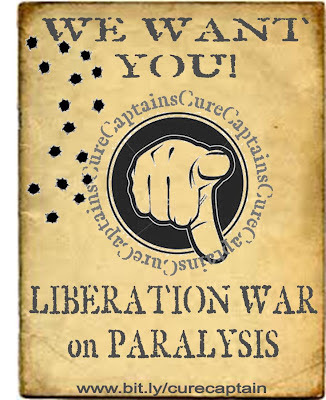 If you want to have a "Captain Cure Liberation War on Paralysis" these are the kind of things that need to be addressed. Please go ahead and start a campaign to get the information if you're not satisfied. Don't worry Dennis, it's already started, thought you might like to be a part of it. "The thing that makes me shake my head in bewilderment is the fact that without Dr. Young and this great website he founded, some of the 501(c)3 foundations that were formed because they used this website as a springboard, would not exsit and yet they sometimes seem to be the ones to instigate the whispers here and there that Dr. Young is some how off the mark and he needs to be reeled in and brought to instant justice with embarrassing posts on the very forum he dedicated his life too!!" Sounds like leniency to Wise is promoted there. We all owe the man for his tireless efforts and dedication. Conjecture and whining from Wise's chief fundraiser. Who the F*** cares about any of that crap? Where's your website there troll? If anyone would like to know more about the funds re: JustADollarPlease you can download this OPRA form and send it to Rutgers. Dr Young has been asked several times about the fund and keeps putting it off. I don't feel comfortable about those JustADollarPlease funds. He has said it's all volunteer work by him and two part timers at Rutgers. Over $200,000.00 spent this year on volunteers? They don't even have a trial location with an investigator, nor did they have the results from china to give to the FDA. You're right. Nobody gives a damn. Anyone stupid enough to send their money away for this rubbish deserves what they get. A fool and his money are soon parted. as of today per dr Wise: "Regarding the IND, we have not submitted the US FDA IND yet because we have not yet had an investigator meeting with U.S. investigators. We cannot submit an IND until the U.S. investigators have agreed to the protocol. We are trying to get this investigator meeting together in May but it may not happen until June"
so again why the justadollar money already spent? Donuts, coffee and airfare to China. your words dennis: (Now we have to make sure that this is not just something that looks good, but is actually good for all of us. I'm saddened not only by the waste of money, but also because this kind of scandal kills hope, and now it will be our job to rekindle hope. To demand a change of leadership. To demand money be spent on measurable outcomes, not just "raising awareness". To demand more transperancy and community involvement. I will have more shortly. Start your own website troll Bob. Still time to send a message for cure - SOON! The final click for cure - Roman Reed Law - SIGN!